If you work in the world of marketing, the Cambridge Analytica news didn’t exactly shock you. In fact, most of us in the business reacted somewhere between a shoulder shrug and an eye roll. It’s not that marketers’ support the misuse of data—especially for the purposes of spreading false or “less accurate” information to sway an election. But most of us have known that Facebook and Instagram’s business models are all about selling data. As I told my son when he left for college, just because you can doesn’t mean you should. Just because Facebook allowed organizations like Cambridge Analytica to flood a social network with questionable content in an attempt sway an election doesn’t mean Cambridge Analytica should have done so. Organizations with evil motivations have always existed, so I doubt any of us are surprised. But many of us are genuinely shocked that Facebook either willingly turned a blind eye to this corrupt use of data or was too stupid to connect the dots. (They’re definitely not stupid.) Using Facebook/Instagram data to sell potato chips or toothpaste is one thing. Using that data against the TOS to try and ruin a democratic election is another thing entirely. Facebook lost $60 billion (that’s “billion” with a “B”) in the week that the news dropped, but it is unlikely that fact alone motivated this mad dash to turn off the Facebook data faucet. It is more realistic that Mark Zuckerberg knows once trust is lost, brands often crash and burn. The recovery from such a huge betrayal is going to take years, if not longer. And remember, Facebook is a public company—selling data for ad targeting is inherent to their business profit model. It’s not that your pics of Muffy the poodle in PJs aren’t valuable. But ads that sell you PJs for pets are more valuable to shareholders. They have shut down part of the Instagram API. They are limiting the data available from (or requiring user approval for access to) Facebook’s Events, Groups, and Pages APIs, plus Facebook Login. They are shutting down search by email or username and changing their account recovery system after discovering malicious actors were using these to scrape people’s data. Facebook CTO Mike Schroepfer told TechCrunch, “Given the scale and sophistication of the activity we’ve seen, we believe most people on Facebook could have had their public profile scraped in this way.” There is a new API access coming, says Facebook/Instagram, so while some functionality may return, it may not return in a significant way. A huge marketing technology industry has grown on the backs of these data streams. There are hundreds of apps with tools to interpret the data, visualize the data, and activate on that data. That means some of those MarTech subscriptions you have to monitor competitor accounts (or any account without permission) will have extremely minimized data results. Work with your technology providers and vendors to rescope those relationships and determine if limited data is better than none. In addition, if you are a business and have not yet opted to sync your Facebook and Instagram accounts (thereby creating an official Business Profile status), you will not be able to use technology partners to have access to your own data. Rival, a social media analytics platform, discussed this here with its readers. Paid media will still work, but with fewer data inputs, it may be become less targeted. 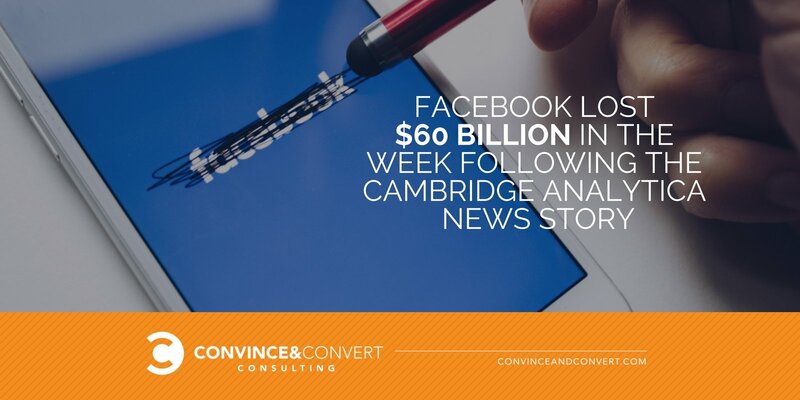 A Facebook rep told a Techcrunch client that “for any Custom Audiences data imported into Facebook, Advertisers will be required to represent and warrant that proper user content has been obtained.” Understanding this is essential for your plans and will likely require revisiting your conversion goals, click-through goals, and more. It’s time to adjust your digital marketing strategies. If you have dedicated large chunks of your marketing budget to content programs that rely on this deep layer of data, it’s time to sit down with your agencies or in-house teams (or, ahem, call in brilliant advisors) to determine a pivot path. One area of consideration—already on the rise after the last Facebook algorithm shift, which prioritized “friends and family” content over loose connections—is influencer marketing. With the loss of potential insight from data driving your content targeting, it will be more important than ever to work with content creators who can get your messages in front of communities and audiences that they “own” in strategic and authentic ways. Facebook is changing its handling of user data. It's time for your business to build a pivot plan. Rescope your MarTech subscriptions and partnerships. Sync your Facebook and Instagram accounts to generate a discoverable Business Profile. Reset your paid advertising KPIs for conversion, click-through rates etc. Consider increases in programmatic, given the additional data sources still available. Work with your agencies and partners on new content syndication strategies like influencer marketing. As with all things involving the major social platforms, we will all adjust to these changes and move forward. In the meantime, if you would like to dig deeper into the effect this has on your business, give Convince & Convert Consulting a call. We are here to help. 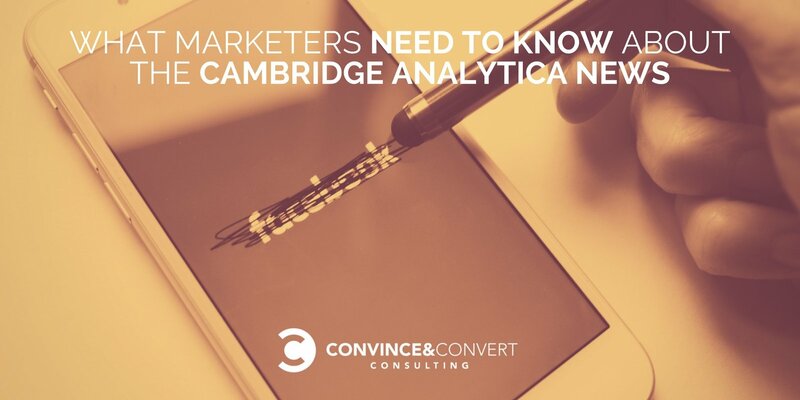 The post What Marketers Need to Know About the Cambridge Analytica News appeared first on Convince and Convert: Social Media Consulting and Content Marketing Consulting.